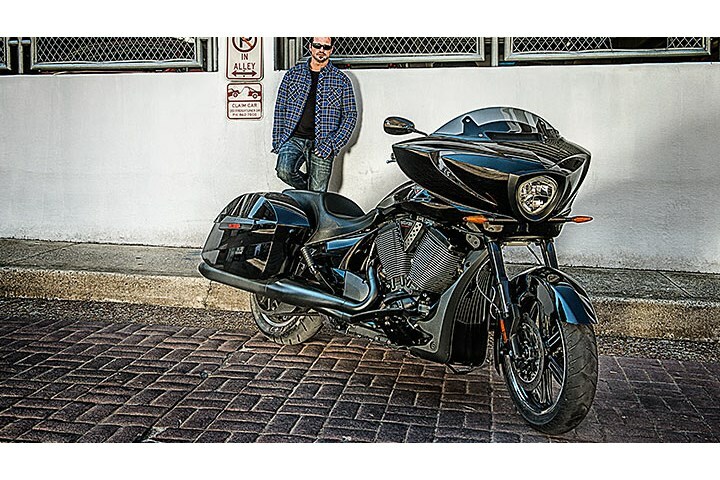 Bagger motorcycle riders ride in style on the Cross Country 8-Ball from Victory Motorcycles. It has a stylish fairing, audio, convenient storage space, comfortable seating for one or two riders, and blacked-out style. 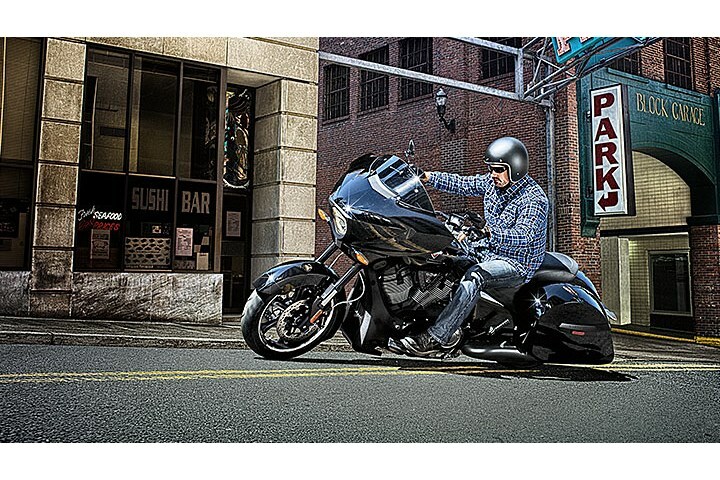 The Victory Cross Country 8-Ball is smooth and stealthy. It dominates the streets with its distinctive attitude and is loaded with blacked-out features from the exhaust to the engine to its unique, sculpted fairing. The Victory Cross Country 8-Ball has a sleek, stylish fairing that offers impressive weather protection to enhance your ride. The fairing has twin audio speakers and an auxiliary audio cord. Use the cord to connect a smart phone or the device of your choice to pump your personal playlists through the speakers. These saddlebags deliver exactly what you’re looking for. They offer 21.3 gallons of convenient, lockable storage space. The lids have a weatherproof seal to help block the elements and protect your cargo, and they open and close easily with one-handed operation. 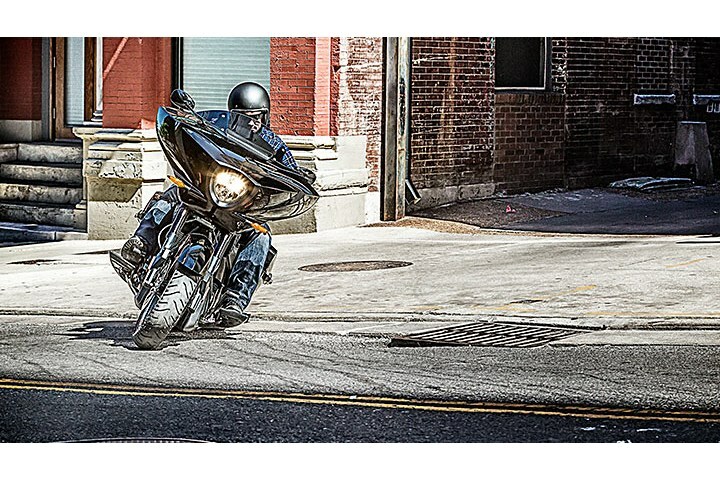 With the Victory Cross Country 8-Ball, you’ve got attitude – and power. The 106-ci Victory® Freedom® V-Twin delivers 106 ft-lb of torque, and it’s a smooth, efficient engine – counter-balanced and fuel-injected. The 6th gear overdrive of the Victory 6-speed transmission drops the RPMs and delivers the smooth ride you’re looking for. 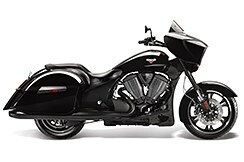 Enjoy solo riding or share the Victory Cross Country 8-Ball riding experience. It has a roomy, stylish seat that’s so comfortable you can ride all day and leave the pack behind. Add Lock & Ride® accessory backrests for custom style and extra support. The 26.3” seat height is the lowest in its class. This helps riders with all inseam lengths plant both feet firmly on the ground. A lower seat height provides a rider with greater control of the bike and enhances a rider’s confidence at low speeds and when stopped. The rear suspension keeps the ride smooth. It provides 4.7” of travel, and its air shock is easily adjusted using a hand pump for a consistently smooth ride. Ride solo or 2-up, with or without cargo, and the rear suspension will keep it smooth. Your Victory Cross Country 8-Ball belongs on the road, not in a gas station. The 5.8-gallon fuel tank gives you outstanding range so you can rule the streets and enjoy long stretches on the open road between fill-ups. 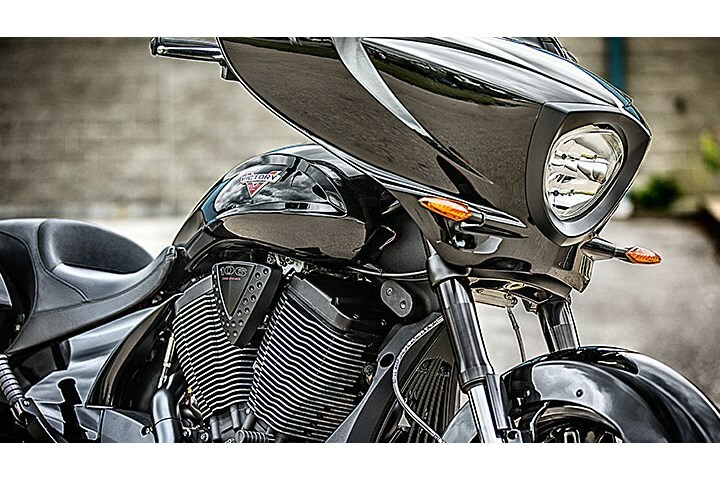 Add Victory Accessories and you can customize your Victory Cross Country 8-Ball to suit your individual style. Add comfort, convenience, cargo or performance accessories. Many of them feature Lock & Ride® technology so they can be installed quickly and easily – without tools.